‘The Way Home’ is the new arc in this terrific series, taking us back to the heart of this title, with the Unknown Soldier coming to the aid of Paul, a child taken by the rebels and forced into their army. His story, told through his own words and drawings, is harrowing, but all the more disturbing for the fact that you know that this is a very real scenario endured by many. Having escaped the GUSCO camp (aimed at rehabilitating child soldiers), having escaped the hellish conditions of forced conscription into the LRA, Paul is now desperate to get to his family in an IDP camp. Moses, initially reluctant, agrees to help this tragic child. That summarises the issue, but does not do justice to the contents. The writing, as ever, is brutally honest in its depiction of a war in Africa where the most vulnerable are the most exploited and the casualties of war are predominantly the innocent. While Dysart is keen to emphasise the suffering – and this he does with subtlety, power and honesty – he can also weave a terrific and involving story around these bald and terrible facts. This issue sees a change of artist, as Ponticelli takes a break. The replacement artist is DRC illustrator Pat Masioni. I am a huge fan of Ponticellis work, but Masioni ably takes up the art duties and makes this issue his own. His art, like Ponticellis, lays bare the brutality of war, the grief of suffering and the evil that men can do – witness his drawing of a child being ripped from his mothers arms, her pleading, the hostility and threat of the rebel soldiers – and does it with an energy and anger that drives the story, engaging the reader. 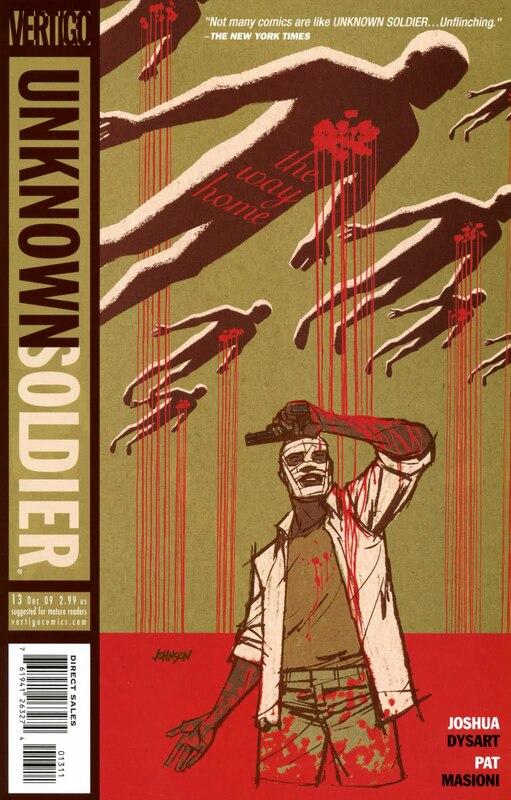 Unknown Soldier #13 is a change of pace from the high octane thriller energy of the ‘Easy Kill’ arc. It is more contemplative, more terrifying, more heart-rending. The focus is back on the victims of the wars and internecine struggles in Africa. There is no greater tribute to this title than this – Dysart and his supremely gifted artists sear these terrible events into your conscious. A lot of the images and words are not easy to forget. and nor should they be. Unknown Soldier is the most important comic book on the market right now, it is political, righteous, angry, engaging and gripping – no other title manages this feat.